Thinking of trying skiing or snowboarding for the first time? At Horseshoe Resort, we make it easy for you to turn that curiosity into a life-long passion! When arriving at Horseshoe Resort for skiing and snowboarding, take the first right into our main parking lot. Once parked, please proceed to Guest Services in the main chalet where you can get all your information and get started for a fun filled day of skiing or snowboarding! You can purchase your lift ticket at Guest Services, where they will help you decide what ticket is best for you (unlimited, day, afternoon or night). You will receive your daily lift ticket, which is to be attached to your jacket. It is recommended that the wire is placed through a pocket zipper, and that the actual ticket then gets folded over the wire and stuck together. The lift ticket is your pass up the hill on any lift and needs to to be visible at all times when skiing/snowboarding. DON’T HAVE YOUR OWN SKIS? NO PROBLEM! We’ve got the ski and snowboard equipment you need for that first day on the hill. When you enter our rental department, the staff will give you a hand with getting set up. They will need your rental form in order to get equipment for you. Our staff will size you for a helmet, ski/snowboard boots and skis/snowboard. There will be cubbies in the rental department where you may keep your boots/shoes while you’re wearing our ski/snowboard boots. Once you’re all set up with your equipment, make sure to put your gloves on and head on out to the hill for some fun! At Guest Services, you may purchase and book a Discover lesson. One of our 100+ instructors will lead you in a group lesson to make that first time on the slopes a thrill. 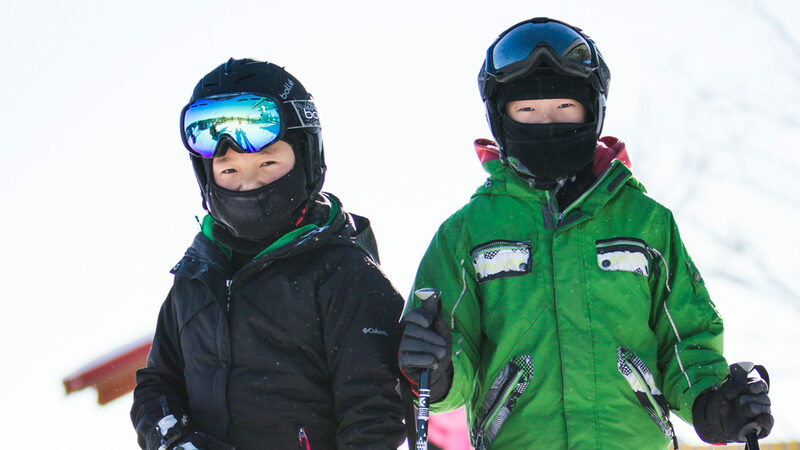 This package includes everything you need on your first day out on the slopes, including an all day beginner lift ticket, equipment rental and a 2-hour group lesson. This is a great deal for people that have never been skiing or boarding before! You can ask the employees at Guest Services which hills are open and they can also show you on our maps. When you take the chairlift up the hill, there will also be a map at the top so you can see which hill you’d like to go down! You can also check our website. Feeling a little hungry after some fun outside? We have great selection of delicious food here at Horseshoe Resort. If you’re needing a little relaxation time with some hot coffee and fresh baked good, head to the Shoe Brew Cafe in the lower level of the main chalet. Wanting a quick and yummy meal so you can get right back on the slopes? Head to our Cafeteria located on the top floor of the main chalet. If you’re wanting a delicious sit down lunch or dinner, check out the Crazy Horse Sports Bar & Grill. Just take a seat and let our servers help you out! Last but not least, if you’re feeling like a fancy, relaxing, gourmet meal, visit the Inn and enjoy a delicious meal at the Inn Steakhouse. Wear layers that will keep you warm under your winter jacket. Sometimes an extra sweater might be needed on those beautiful cold winter days. Snowpants are highly recommended, as they protect you from the cold and snow. Denim and cotton are not recommended, as the snow will soak through, making you very cold. Wearing eye protection is very important. Goggles or sunglasses are highly recommended. Sometimes bringing an extra pair of socks is a good idea, just in case your toes get cold. Gloves and hand wear should be water resistant–you don’t want to have cold hands all day! But if they do get a tad cold, you can always purchases handwarmers, which will get your hands back to being comfy and warm (they also have these for your toes too). If you’re feeling cold, please come inside to warm up… and maybe get yourself a delicious hot chocolate!